Well, it’s almost the beginning of a new year! Welcome back to the office, if you’re at work again. (Sorry, I am, too.) Those of you still lolling around the house, go take a shower! Wash off the post-Christmas crust, and go have a drink with someone who isn’t in your family. For everyone: WHAT ARE YOU WEARING NYE?!?! 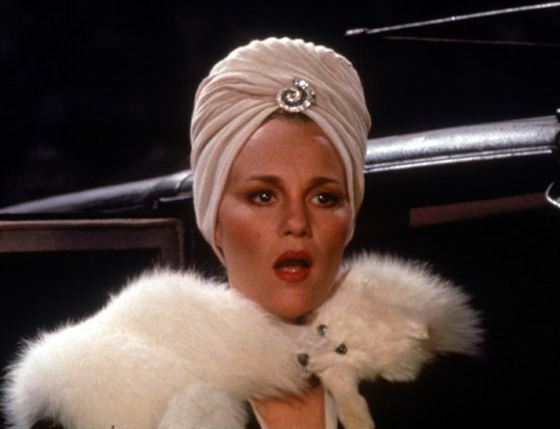 I have a fantastic vision of a black and white ensemble, inspired by the 1970s and Madeline Kahn’s Young Frankenstein turban!!! Yes, THIS turban! I’ve got a diamond brooch picked out and everything! I haven’t decided exactly what to do with my hair (completely engulfed or flowing out in a billowy cloud of curls?!?! ), but I am positive that it will be fabulous! The real kicker is a vintage black velvet, rhinestone-studded belt from Neiman-Marcus!!! I needed an ensemble to show it off, and for whatever reason a jumpsuit seems to be the ideal option, so I’m GOING FOR IT! If the jumpsuit does (and likely should) bow out in the coming year, at least I can have some farewell fun before it does. They’ve been on the red carpet for several years now! If Kristen Wiig can do it, so can I. Cheers to getting totally naked to pee! So, the options for NYE are endless! They can be, but are not limited to: fancy dinners, fancy parties in hotels and/or bars, fancy house parties, more laid back affairs, or drinking alone. Although all the planning can be a bit exhausting, once you’re there, it’s always a good time! The point is, however you celebrate, it ought to be completely covered in glitter, your makeup should be outrageous, and even if you know it’ll all be melty and slightly sticky by the end of the night, it’ll look damn good when you walk in the door. We’re talking a disco and glitter light show presented by RuPaul on a Disney budget! If you haven’t put together an outfit, it’s not too late! You still have an evening and a lunch hour to make this happen, and Charming Charlie stays open LATE! Plus, the post-Christmas sales on extra-shiny things are currently going on, so coming up with at least one statement piece won’t be that difficult. You can be wearing all black and throw on a fancy scarf, feathers, sequins, or a necklace and you are set! Or those CRAZY heels you never get to wear! See also: Glam Hair Accessories! There are TONS more amazing looks, some inspired by celebrities, others by Pinterest, but basically if you’ve got gold, feathers, or fringe, you will be the belle of the ball! Also, try taking a look in your closet to see what possibly amazing ensembles have been hiding! If you’ve got a small/non-existent budget, wear something simple and/or elegant, and let your makeup and hair create the statement! LOVE this!!! The makeup is gorgeous, ties in with her statement necklace, and her hair is a magnificent halo! I adore this retro-inspired wave, bold lip and classy necklace combo! She looks so incredibly elegant, but absolutely modern at the same time, and her updo is perfect! Whatever makes you feel your best, that’s exactly what you should do! That being said, sometimes a little bit of extra prep/effort is usually worth it, as long as you have fun during the process. Since some folks are coming from the office, it may be a more subdued look, but no matter how you look or where you go, have an excellent NYE! I’m all about themes, so forget about your resolutions for one more night, and let’s all get super fancy! Do you have fun plans for this NYE? Do you have a NYE tradition? Have an outfit picked out?? What do you love about it?